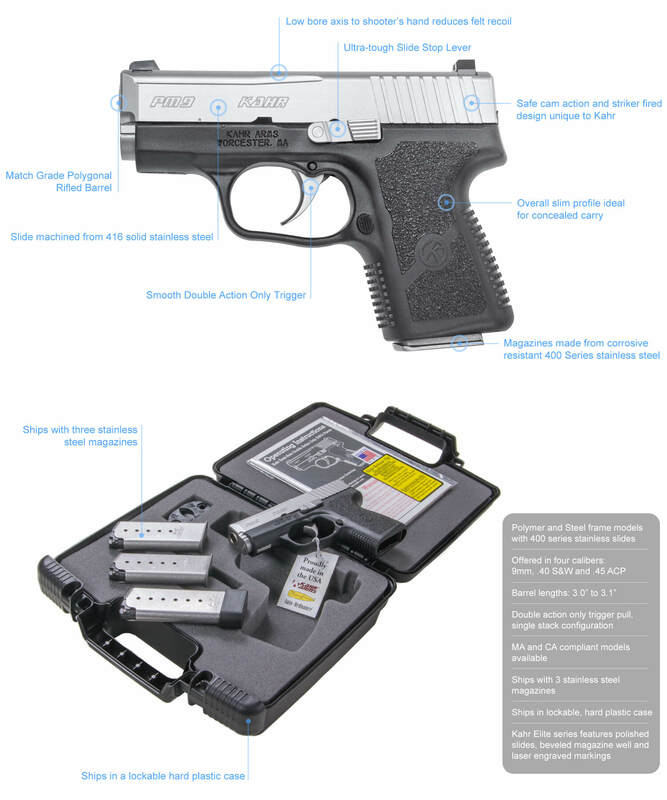 Kahr’s PM & MK Series offer the highest quality thin profile subcompact, pocket carry handgun on the market today. Bigger is not always better especially when looking for a concealed carry handgun. Features include a Lothar Walther 3” polygonal rifled match grade barrel, smooth DAO trigger, stainless or blackened stainless slide and an option for night sights. The PM & MK Series, available in 9mm, .40 S&W and .45 ACP (PM only) have made Kahr Arms a leader in the firearms market providing a high quality handgun that is light, thin, small and optimal for concealed carry. Weight 4.5 lbs., 4.7 lbs., 5 lbs., 5.3 lbs. Length O/A 5.7", 5.4", 5.3"
Slide Width 1.00", 0.94", 0.9"